German Horse Center offers an unparalleled service: If your vet rejects the pre-purchase examination, GHC will pay for the next one. a purchase contract with the partner is concluded via GHC. Reimbursement can only take place if GHC has been informed in writing that you, as potential purchaser, have decided against purchasing a horse in which you had originally been interested due to the negative result of a veterinary inspection - commissioned and paid for by you, and for which evidence is provided, and the next veterinary inspection takes place within 14 days after GHC has been informed to this effect. Costs exclusively for inspections in Germany by a vet registered in Germany will be reimbursed to the amount of the invoice, and to a sum not exceeding EUR 1,200. Reimbursement is made on presentation of the vet's invoice and evidence of payment, following full payment of the purchase price of the horse. 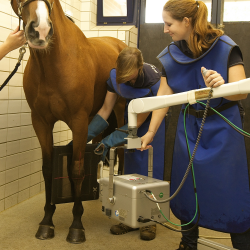 For pre-purchase examination, German Horse Center recommends a selection of internationally experienced veterinarians and renowned equine clinics with modern equipment and digital X-ray devices that produce sharp X-ray images. Many of these medical teams annually perform up to 1,000 pre-purchase examinations, pursuant to international standards, for customers all over the world. Many of them are accredited FEI veterinarians. Your prospective horse will undergo a clinical and a radiographic examination in line with your requirements and/or instructions provided by your own veterinarian. The results of the inspection and the X-ray images will be transmitted digitally to your veterinarian for further assessment. Of course, the veterinarian who carries out the examination is available to discuss any questions you or your local veterinarian in Germany or abroad may have about the results. They all speak fluent English and have good knowledge of the technical terms. You are of course also welcome to ask your own veterinarian to examine the horse. Such as: Ankum Equine Clinic, Mühlen Equine Clinic, Bargteheide Equine Clinic, Dr. Gerd Brunken Specialist Veterinary Practice for Horses, Dahlkamp Specialist Veterinary Practice, Destedt Equine Clinic, Lüsche Equine Clinic, Telgte Equine Clinic, Dr. Cronau Equine Clinic and many others. The Ankum Equine Clinic carries out more than 1,000 purchase examinations every year. The team currently consists of eight veterinarians. They are led by Dr. Philipp Lingens and Dr. Stefan Tietje. A particular strength of the clinic is its ultra-modern mobile equipment for carrying out purchase inspections on-site. The Ankum Equine Clinic is one of the trusted veterinarians accredited by the Hanoverian Association for auctions and the licensing of stallions. 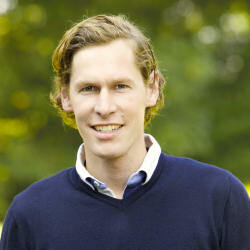 Dr. Lingens was born in 1974 and studied Veterinary Medicine in Budapest and Hanover. From 2000 to 2005 he worked as a veterinarian for horses in Germany, England and Belgium. Since 2005 he is a self-employed veterinarian for horses and incorporated 2007 the Equine Clinic in Ankum together with his business partner Dr. med. vet. Stefan Tietje. His main assignment is focussed on orthopadical care of sport horses as well as pre-purchase examinations on national and international level.